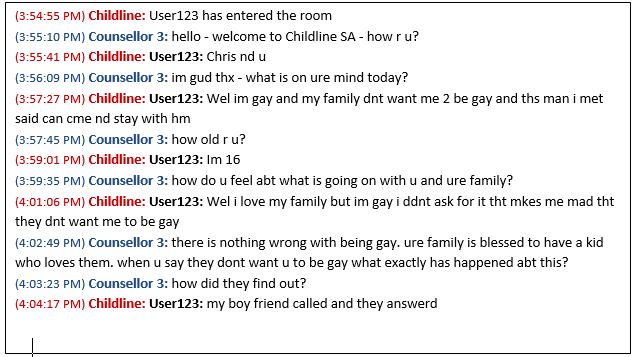 Childline SA is primarily a counselling service for children up to the age of 18. We chat to children from all over South Africa as well as adults that have concerns about children. We are available Monday-Friday, 2pm-6pm, except on public holidays. They're a bunch of different people, some old and some young. They all work for us across South Africa. They have all sorts of hobbies and interests. But most importantly, they all care about young people and give up some their time to volunteer as counsellors. They have been trained on our Crisisline Counselling Course and are constantly updated with issues you may be facing. Usually a counsellor chat lasts around 30 minutes. But this could be less or more depending on what help you need. If you need to contact us again, we'll always be here for you. 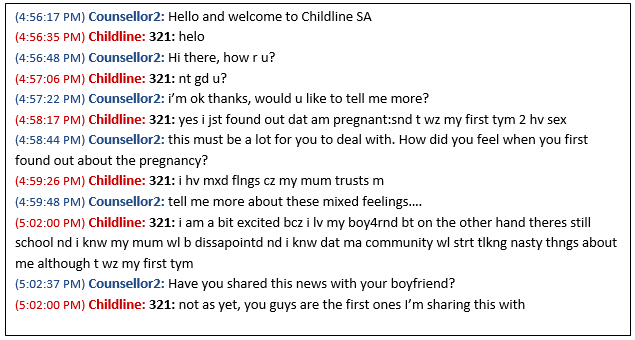 Since 2010, Childline SA has chatted to over 13 000 youth through online counselling! It's just between you and Childline. We're a safe place for you to talk. We do keep track of chats to help understand what you're going through and support you if you contact us again. It can also make it easier for us to get help to you if you're in danger. These chats stay safe at Childline. It's quick and easy to chat to us. You don't need to give your email address or your name if you don't feel comfortable. If you do give us any details, it remains private and confidential. Confidentiality means not telling anyone else about what you've said unless we feel you are in danger or may need further help. Why can't I use the counsellor chat at night? If you get cut off or need to end a chat suddenly, you can log in for another counselor chat. It helps to let the counsellor know you got cut off before. If you were talking about something serious like getting help with self-harm or suicidal thoughts, it's important to let the counsellor know if you feel safe or not. Are you interested in a volunteer counsellor for the Online Counselling Project? NB: Volunteers for Online Counselling Project have to be Durban based.